The biggest problem today with B2B focused businesses is access to decision makers – emails are unanswered and phone calls die in the Voice Mail Box. B2B focused businesses that have come out of this rut have done so by leveraging the power of online marketing and the good news is you can too! Here’s a session where all will be made clear. 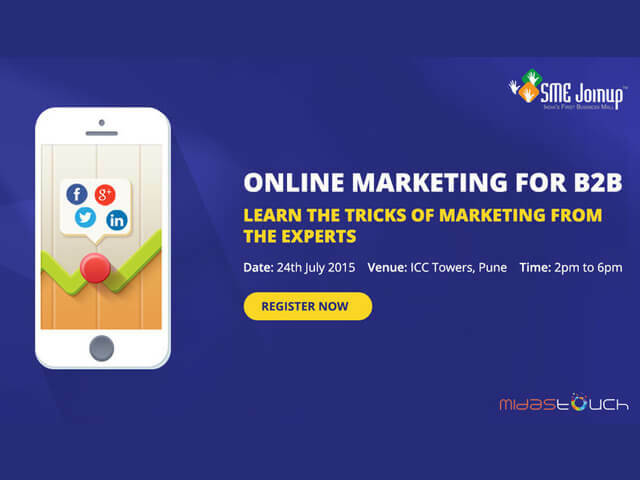 India’s “B2B Social Media Agency” of the year, Midas Touch, and “Lead Generating Platform for Small Business “, SME Joinup present a ½ day event designed to give you an overview of how you can make Online Marketing work for your Business and equip you to take the right decisions.